One year ago, we introduced the first major addition to our coffee portfolio in years, Rainforest Alliance Certified™ Dark Roast Coffee. This year, we decided to take another step toward providing our guests with an even wider variety of coffee beverages by expanding our Espresso platform and introducing Dunkin’ Donuts’ first Macchiato. Made with steamed milk and topped with a double shot of Dunkin’ Donuts’ rich, freshly-brewed espresso, guests can order the Macchiato hot or iced starting today! So why did Dunkin’ Donuts choose the Macchiato as the latest extension of its Espresso line? We spoke to Janet Rock, Dunkin’ Donuts Research and Development Technologist and member of Dunkin’ Donuts’ Coffee Excellence team, and found that when it comes to coffee, our guests look to its functional benefits, but with espresso-based beverages, it’s all about fulfilling an emotional want. For these occasions, Dunkin’ has offered handcrafted Lattes, Cappuccinos and shots of Espresso since 2003 but we always look to provide our guests with more variety, and adding Macchiato to our Espresso line does just that. Like all beverages, the Macchiato can be customized with flavor swirls, different dairy options and sweeteners. To help transition into Fall, I recommend trying the Iced Pumpkin Macchiato. 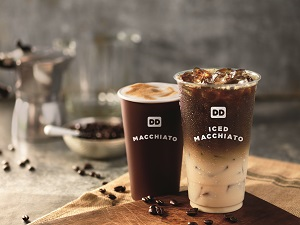 To celebrate our new Macchiato officially becoming available in our restaurants nationwide, we’re giving DD Perks members an exclusive offer to try our hot or iced Macchiato, any size, for just $1.99 when they pay with their registered DD Card on the Dunkin’ Mobile App. This offer is valid now through the end of October!